And they’re off! Now that the filing period has closed for the new election in North Carolina’s 9th Congressional District, there are 13 candidates on the ballot, 10 of whom are Republicans. The primary is scheduled for May 14, though with only one Democrat on the ballot, the GOP will be the only party contesting in the primary. The General Election will follow on September 10. If no primary candidate receives 30 percent or more of the vote, however, a second primary may be called on September 10, and the General Election would then be held on November 5. All of this was put in motion after the State Board of Elections called for a new election in the 9th District. Republican Mark Harris was the presumed winner in last year’s General Election by a 905-vote margin over Democrat Dan McCready, but significant evidence of illegal absentee ballot collection in Bladen and Robeson counties was found. At the conclusion of its evidentiary hearing into the allegations, the Board called for a new election. Since the hearing, five people have been indicted and subsequently arrested, including McCrae Dowless, the alleged ringleader of the ballot-collecting scheme. 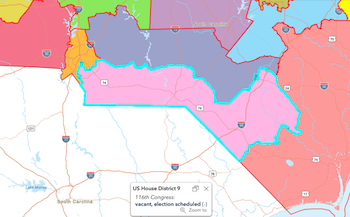 As we informed you in our recent story on the special election in NC’s 3rd Congressional District, North Carolina law does not require candidates for the U.S. House to live in the district in which they are running. According to a residential address search on the General Assembly’s Find Your Legislators Page, five of the candidates in this race live outside the 9th District: Republicans Chris Anglin, Leigh Thomas Brown, Kathie C. Day, Stevie Rivenbark Hull, and Albert Lee Wiley, Jr.